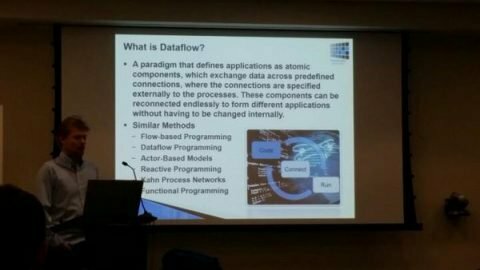 CTO Lars Fiedler presented “Leveraging Flow-based Programming for BI Report Creation” at the Boston Business Intelligence (BI) User Group on May 6th at Microsoft. The Boston BI user Group is one of the largest gathering of BI Developers, Architects, Administrators, IT professionals and Business Analysts that focus on building real-world Business Intelligence solutions and applications. In his talk, Lars presented the Composable Analytics platform, and presented how it can be used to speed the creation of automated reports that combine information from legacy data sources to complement existing BI installations.